Four-star prospect by Rivals, 247Sports and ESPN … Rated as the top player in the state of Arkansas by 247Sports … Slotted as the No. 11 wide receiver in the nation and is listed at 82nd in the ESPN’s Top 300 in this year’s recruiting class … Four-year varsity letterwinner at Warren High School in Warren, Arkansas … Also lettered in basketball and baseball … Hauled in eight catches for 244 yards, scoring four times in his senior season … Went 4 of 7 passing, throwing for 137 yards and three touchdowns, while also returning three punts for 88 yards … Played on both sides of the ball, tallying 17 tackles with one sack, two forced fumbles and a fumble recovery … Joins a long list of Razorbacks to come from Warren HS, including December signee Marcus Miller … Racked up 1,090 receiving yards and 12 touchdowns on 45 catches as a junior for the Lumberjacks in 2017 … Was also a force in the running attack for Warren HS, rushing for 936 yards on 114 carries, scoring 27 touchdowns en route to 13-2 mark and a berth in the Arkansas 4A state championship game last year … Closed his high school career with 151 receptions for 3,403 yards and 43 touchdowns … CHOSE ARKANSAS OVER: Auburn, LSU, Ole Miss, South Carolina, Florida State, Michigan and others. 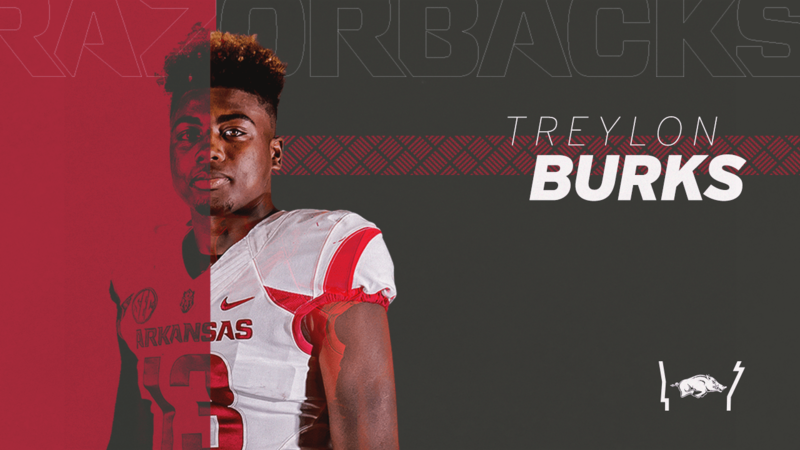 Treylon Burks … Born March 23, 2000 … Son of Shafreda Strickland.